This post was published back on March 18, 2015 and may be outdated. Please use caution when following older tutorials or using older code. After reading be sure to check for newer procedures or updates to code. Today I’m happy to say I can offer you an awesome freebie. A lovely member of the PixelKit team got in touch and has allowed me to offer a sample of one of their wonderful UI Kits to you lovely people. The kit comes in the form of a simple PSD and has been tested by myself to make sure it is working without issue. Everything is organized nicely in Layer Sets & is ready for use in whatever you have planned. Fair warning that you may get a font warning about needing the font Cabin and Proxima Nova Light to open the file without Font Substitution, or using the Creative Cloud TypeKit service. Cabin does not seem to be used for any of the UI elements and Proxima Nova Light is used only for the large numbers on the weather panel. It could easily be substituted for Open Sans Light, or even Roboto Light. Overall I love this kit & highly recommend it to anyone looking for a modern flat UI. They are extremely popular at the minute after all. Thanks to the lovely people at PixelKit for allowing me to post this sample, and if you would like the full kit that contains over 100 UI elements you can purchase the full kit on PixelKit’s website. 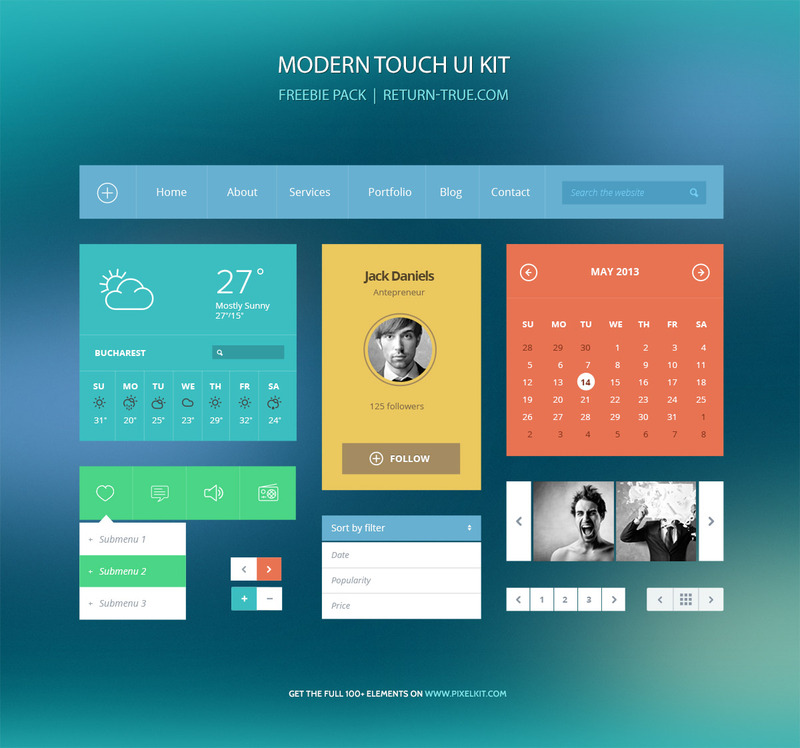 But enough chatter, click below to get your free sample of the Modern Touch UI Kit from PixelKit.